This is the flagship beer for Cigar City Brewing Company in Tampa Florida. Jai Alai IPA (pronounced "high-lie") pushes the boundaries of an American IPA with almost enough hops to push it into the Double ( or Imperial) IPA category. However when you try it you'll notice that even though this is a hop monster its also beautifully balanced with a caramel sweetness that makes this one of the best IPA's I've had the opportunity to try. The hop profile is professionally choreographed with flavors of citrus and piney bitterness that has fruity highlights of peaches and apricots. This is proof that the brew geeks over at CCB know how to make some pretty decent suds. If you haven't tried this, or any CCB beer for that matter, don't delay any longer. Get out there and try some of the best craft beer America has to offer. Cheers! Appearance: This handsome IPA poured a bright copper color with perfect clarity. Head was about two-fingers of creamy goodness that settled to a thick film. The head lasted quite a while leaving behind some incredible lacing that covered the walls of the glass as if it was painted on. Smell: Right off the bat the hops jump out at you with a mixture of citrus and fruit (grapefruit, orange and peaches) and a piney earthyness. Some caramel makes it’s way into the nose adding a nice sweet addition to the bouquet or hops. The smell of this one really gets the mouth watering. Initial Taste: The flavor starts off with a caramel and toasted bready sweetness. This sweetness doens’t stick around long as the big hoppy backbone comes busting through with a big citrus and pine spiciness that leaves your tastebuds begging for more. This big hop profile finishes smooth with a subtle fruitiness that tastes like a mix of peaches and apricots. Aftertaste is dry and a little citrusy. Thoughts: This is the flagship beer for Cigar City Brewing Company in Tampa Florida. 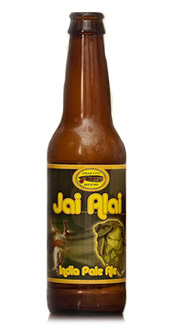 Jai Alai IPA (pronounced “high-lie”) pushes the boundaries of an American IPA with almost enough hops to push it into the Double ( or Imperial) IPA category. However when you try it you’ll notice that even though this is a hop monster its also beautifully balanced with a caramel sweetness that makes this one of the best IPA’s I’ve had the opportunity to try. The hop profile is professionally choreographed with flavors of citrus and piney bitterness that has fruity highlights of peaches and apricots. This is proof that the brew geeks over at CCB know how to make some pretty decent suds. If you haven’t tried this, or any CCB beer for that matter, don’t delay any longer. Get out there and try some of the best craft beer America has to offer. Cheers! I thought this beer was excellent also. Another one of my favorites from Cigar City is Guava Grove. Someone sent one of these to me several months ago and I absolutely loved it – really great beer. This beer is available where I live, and though it is certainly a really good beer, I believe it to be one of the most over-hyped beers around. I prefer a 90 or 60 minute IPA any day and can probably name half a dozen others easily. If you then factor price into the equation, this one falls even farther down the list. $11 for a six pack at the cheapest retailer just a few hours from the brewery? Pass! @Rob Great point about the price and location. I don’t understand why it’s so much within the same state. And I agree, Dogfish Head 90 is a superior beer. @Dave Thanks for the comment! I haven’t tried the Guava Grove yet but I’m looking forward to checking it out. Cheers. There’s no doubt the standard sngetrth of IPA in Britain in the second half of the 19th century was about 1060 OG or a teeny bit higher: I’ve looked at ads from well, dozens, certainly, very possibly more than a hundred different Victorian brewers, and when they did an IPA it almost always sold at 1s 6d a gallon, which when you peg that against known prices and sngetrths of other beers, suggests almost incontrovertably something in the 1060s. Certainly hardly higher, if at all. Out of many dozens, I can think of only two or three IPAs I have seen that were more expensive than 1s 6d for a gallon and that weren’t carrying a “top brand price premium” of the sort got away with by Bass and Allsopp (who charged 1s 8d a gallon, the same as Bass IPA, for their own “D” IPA – not to be confused with DIPA). It’s not true, from the evidence I’ve seen, to say IPA was absolutely never at all a strong beer, but IPAs stronger than the 1060s were very rare indeed – rare enough to be (dare I use this expression?) “Not True To Style”.